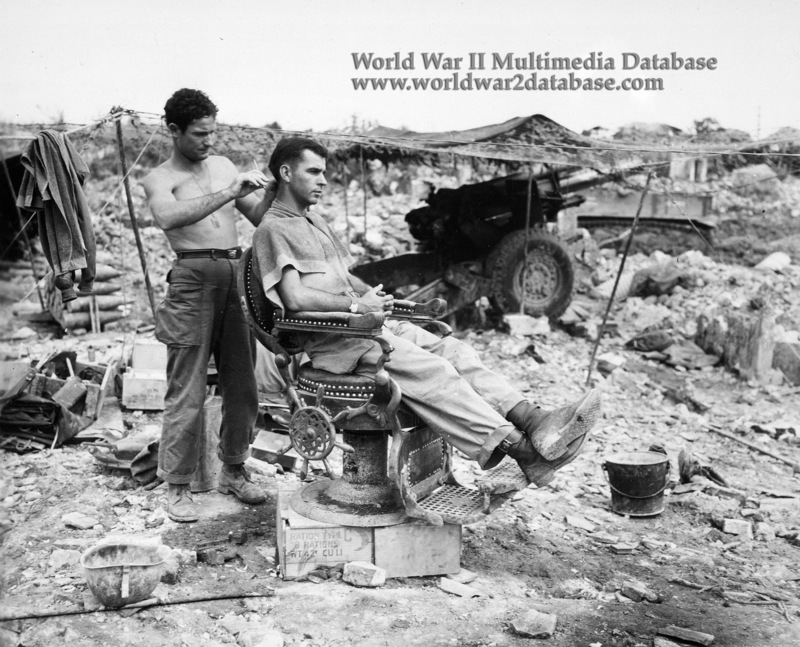 With their M1 155mm howitzer behind them, Private First Class Troy Dixon, Leadhill, Arkansas, uses a Japanese barber chair to cut the hair of Sergeant John Anderson, Anita, Pennsylvania. Both men are from the 363rd Field Artillery Battalion, 96th Infantry Division, XXIV Corps, Tenth Army. War weary from days of heavy combat operations, the 363rd Field Artillery Battalion left Buckner Bay, Okinawa on July 27, 1945 on Coast Guard-manned LST-832 for Mindoro, Philippine Islands for rest and relaxation. The M1 155mm towed howitzer was introduced in combat in 1942. The weapon could fire 40 rounds sustained fire per minute to a range of over 9 miles (14,600 meters.) The howitzer fired separated ammunition, which means that the projectile could be fired with different charges of propellant. After the war this weapon was re-designated the M114.